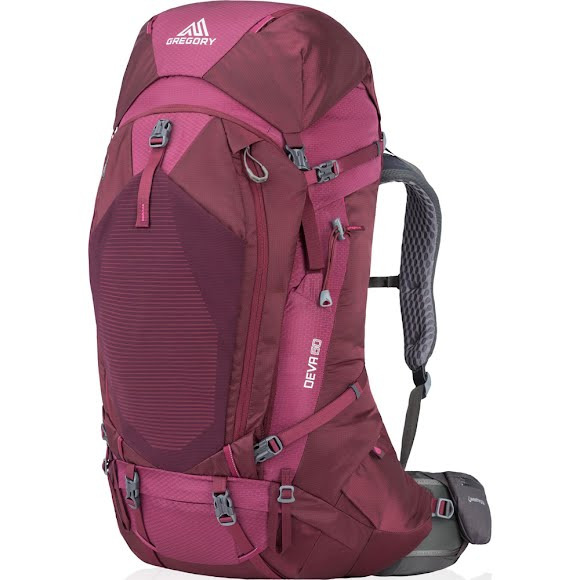 The Deva 60 Internal Frame Pack is one of the best selling women's packs in the backpacking category, and for good reason. Gregory's designers have done all of the work so you can concentrate on soaking in the backcountry scenery. Endless organizational options and targeted features make packing and finding things while out in the backcountry a breeze. The Deva 60 Internal Frame Pack is one of the best selling women&apos;s packs in the backpacking category, and for good reason. Gregory&apos;s designers have done all of the work so you can concentrate on soaking in the backcountry scenery. Endless organizational options and targeted features make packing and finding things while out in the backcountry a breeze. Response Auto Fit Suspension (AFS) utilizes independent, pivoting hipbelt and shoulder harness panels that automatically conform to your hip and shoulder angles for an instant, custom fit. The single-stay, composite-reinforced internal frame design provides excellent load transfer and eliminates barreling. Response Auto Fit Suspension (AFS) takes the trial-and-error method of pack adjustment out of the equation, using a harness and belt system that conforms automatically to your body&apos;s individual shape for maximum comfort. Independently rotating panels anchor the hipbelt and shoulder harness to the internal frame, allowing them to pivot into alignment with your hips and shoulders and properly position the load transfer surfaces without requiring adjustment. Inside the pack, a single 7075-T6 aluminum stay integrated with a composite load-lifting panel prevents barreling and provides optimum load transfer, while load stabilizer straps in the hipbelt adjust pack pivot for varying terrain and a lumbar grip panel keeps the pack in place. Thermo-molded, pre-curved LifeSpan EVA foam in the harness, hipbelt, and back panel provide wrinkle- and friction-free comfort over long distances and resist compression over years of use. Measurements 30.0" x 12.0" x 12.5"